While most pond liners are sturdy and meant to last for a number of years, there are occasions when the liner has deteriorated or is punctured and must be replaced. Patching the liner is a messy job that doesn't always work. You also must replace a pond liner if you expand the pond, in order to accommodate the increased depth or bigger dimensions. Fill both 5-gallon containers with water from the top of the pond. The top has less debris than the bottom. Drain the pond to 18 inches. Connect the pond pump to tubing that directs the water downhill and away from the pond. Shut off the pond motor. Catch the fish with a net and place them in one of the 5-gallon containers. Remove the plants and put them in the other 5-gallon container. Drain the pond completely. Remove sand, dirt and debris from the pond liner with a hand shovel. 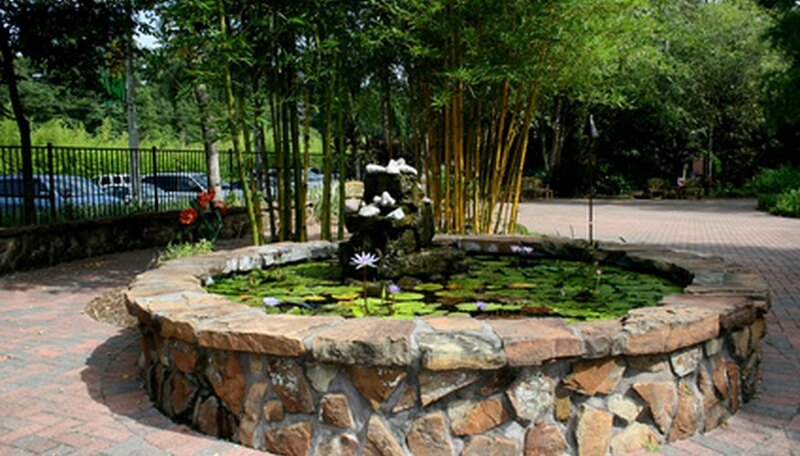 Remove any edging material like bricks, rocks or stones that are holding the liner in place at the top of the pond. Roll the liner up and out of the pond. It might take two or more people to do this, depending on the size of the pond. Check the bottom of the pond underneath where the liner was for stones, tree roots or anything that could penetrate the new liner. Lay a 2-inch layer of sand on the bottom of the pond hole. Place the new liner in the pond. Adjust it so there are as few wrinkles and folds as possible. Again, this might take two or more people. Stand in the pond on top of the liner while the hose runs to fill it. Adjust the liner as the pond fills to avoid wrinkles and folds. Sometimes as it fills, it folds on itself due to the weight of the water. Straighten out the liner where it goes over the lip of the pool and replace the bricks, rocks and stones. Get out of the pool. Add a product that removes chlorine from the water. Turn on the pump. It's best if you also wait 48 hours before adding back the fish and plants, but sometimes that's not possible. In hot weather, the fish might get too warm in the shallow 5-gallon container. Add the plants back to the pond. Scoop out a gallon of water from the 5-gallon container the fish are in. Replace that water with a gallon from the pond. After 15 minutes, do the process again and then again in another 15 minutes. This equalizes the temperature. The debris or muck removed makes good fertilizer. Wear soft-soled tennis shoes when standing in the pool.